I just saw a negative headline about a show I am coming to love, New Girl. Their ratings are going down the headline read, so I want to put in a good word for this show. I actually almost cancelled the series and now I’m glad I didn’t. Jess/Zooey Deschanel toned down her act and added more intelligence to her character, but it’s two of the guys that I’ve come to love the most, Schmidt and Nick, and of the two, I love Schmidt the most. I don’t even know how to explain Schmidt’s appeal and if you watch one show you probably won’t get the full sense of him. Actually, his character is a perfect example of how if you watched an episode or two and said, “no thanks,” you have to come back and give it another try. He developed. UPDATE: Brilliant explanation of why we love Schmidt here. All the characters are developing wonderfully, and I crack up regularly during the show. Honest-to-god laughing out loud even though I’m alone. The writers are doing such a great job. So please give this show a try. And Raising Hope. 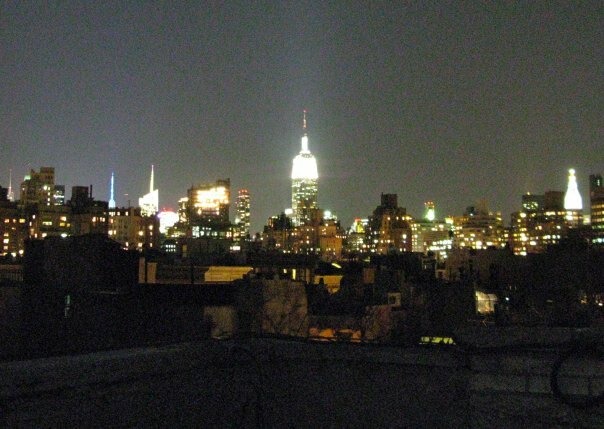 Yet another shot of the Empire State Building from my roof. I’m sorry. But if you lived here you’d find it hard to resist taking a picture of it every time you saw it, too. I’d be in worse trouble if I had a view of the Chrysler Building. I love New Girl too — it’s becoming more of an ensemble show. The NYT magazine last Sunday had Schmidt on a list with other TV characters who had cult followings (jeeze. I can’t remember any of the others except that great guy with the mustache from Parks and Rec). I love Schmidt. Nick bugs me — shave, alreay — but I’m getting to like Winston a lot more. Is it OK if I use your photo of Finney stretching his toes on my blog this Friday? I do a series of photos called “This Picture Makes Me Happy” and that photo of Finney’s toes makes me overjoyed. Bless you for posting this, Stacy. I love New Girl too, mainly because they’re doing such a nice job developing them all as characters (even Jess; although for being the title character she’s still the least interesting). I LOVE Schmidt (all of them really). But why is it so crazy that CeeCee would like him? He’s a good-looking guy. As you can see I’ve thought about this show way too much. But let me just say, as a 30-something woman, married with a kid, it’s impossible to find and keep guy friends. And I always had guy friends, and miss them. So this show feels a need for that. Yeah, guy friends are great. I found a great piece about Schmidt and added a link to it in my post. I love that you guys love this show too!! Vivian, of course you can use my picture of Finney!! I’m so flattered, I love that shot of him too.